"What a find! Andy took some great photos which we and our guests loved. He captured the day so well, without being obtrusive and managed to put everyone at ease. Thanks Andy for capturing some great memories!" "Sue and I are really delighted with the photographs that Andy took of our wedding. His professional attitude, natural, easy manner and excellent 'eye' resulted in pictures that we, and our guests, will cherish and admire for the rest of our lives. We have no hesitation at all in recommending Andy to anyone who is looking for a wedding photographer." "The photography from our daughter Louise's and Ruperts wedding was amazing .....Andy took some lovely photos and caught the feeling of the occasion completely ....... And was so quick with the link for us to download and print the perfect pictures"
"Andy was at the venue before us. He was very friendly and easy to talk to. Took lots of great photos. Would recommend him to all my friends." "Andy was wonderful. Arrived on time. Organised us without seeming to, and felt like one of our guests. The style and quality of the photos was excellent, with a few tasteful photo-shops, but mostly just great compositions in colour and black and white. Can strongly recommend as even my wife was fantastically happy!" "Andy did the photos for our wedding. They are perfect. They show a real story of the day. We didn't have to think about a thing as Andy knew exactly the right photos to take. We can't thank him enough for the beautiful memories he has provided us through our photos. We thoroughly recommend him." “Amazing!! Love all of our wedding photos. Andy managed to capture amazing shots even in the rain. So friendly with adults and children. So many of our guests said what a great photographer he was. Makes you feel so comfortable. Can't recommend enough. Thank you for our beautiful photos." 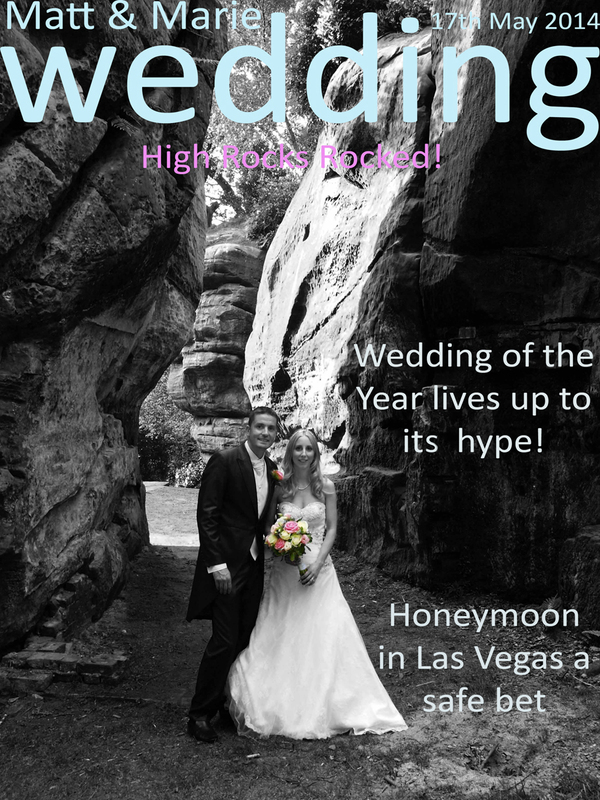 A new service that is now available is on site printing at the evening reception putting guests on the cover of the bride and groom’s dedicated magazine cover. Please contact for more details. “I would like to write to thank you for the excellent service you provided for my daughters wedding. The photographs you took were absolutely beautiful and of an exceptional quality. It was so good to have a photographer who was pleasant and was also willing to take any shots that we particularly wanted taken. Also I would like to thank you for the quickness in which you gave us the disc and then produced the chosen photos was amazing. I have friends who have waited weeks and weeks so was really pleased when we had the disc three days after the wedding. You made a bride and groom very happy. I would definitely recommend your services to any friends or family that required a photographer. “Thank you so much for all you did for me and my husband on our big day. You were great, you put us at ease and even managed to get our 4 children to stand still for you, amazing!!! “You got all the shots I wanted, and it was nice to have a photographer that would take any additional photos we would like to. “I was so pleased with all the photos and how quick you sent the CD through, 3 days after the wedding. The final prints are lovely and of a very high quality, all personally delivered which was lovely.